In 2019, we must embrace sustainability and a long-term perspective. Olivier Boutellis-Taft discusses three challenges facing society and how the accountancy profession is part of the solution. THE most burning challenge humanity is facing is the sustainability of our planet. But the solution is clear: we must change the way we live and do business. In this respect, the EU Commission Sustainable Finance Strategy is essential. Markets are they key driver behind the changes. They have propelled goods, services, wealth and health, but also overconsumption, income inequalities, natural resources depletion and pollution. This is why we need to drive our markets towards the path of global sustainability. We must act now to mitigate the damages done to our planet. Many factors are necessary to achieve sustainable finance, corporate reporting is one of them. This is where the accountancy profession can make a difference. Measuring, disclosing and certifying has been the core business of accountants for centuries. Nowadays, financial performance alone is not enough to determine how a company will develop in the long run. Professional accountants can help companies integrate non-financial and financial information to address the needs of stakeholder and investors on long-term performance. See our blog Sustainable finance: what’s it got to do with accountants? for more on accountants’ role towards sustainability. In the sustainability debate, as in many others, SMEs are often left behind. But in reality, SMEs form the backbone of Europe’s economy. As of 2017, they accounted for 99.8% of all non-financial companies in the EU. SMEs are considered vital to support economic wealth, innovation, job creation, and social integration. Professional accountants’ role is crucial for SMEs. As their trusted advisors, they provide a direct “boss to boss” advice tailored to their specific needs. Accountancy Europe shares best practices and raises awareness on the accountant’s role in supporting SMEs. We also help shape a better EU regulatory environment for SMEs and sustainable economic growth. 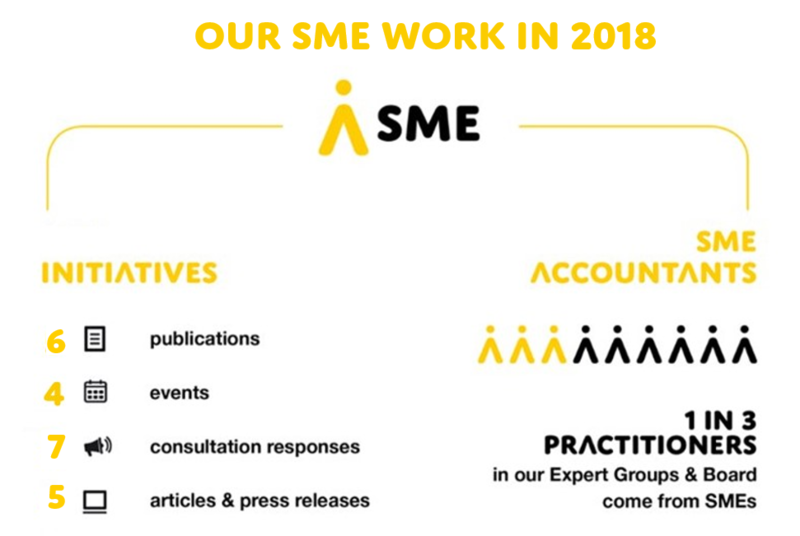 This is one of our key priorities for the following years: to continue our advocacy for SMEs within European policy and profile professional accountants as the SME business enablers. Click on the visual below to see our work on SMEs. For decades, we have nurtured the idea that taxation is a cost and a burden. But we often forget that tax is also one of the foundations of our society, a contribution we make in exchange of what we gain in return. Taxes support the education of our children, the health of our workers, the infrastructures that enable businesses and all the amenities affecting our daily life. But it is high time we make our tax system suitable to a world of technology disruption, environmental degradation and social unrest. The reality is that professional accountants play a vital role in our society by facilitating the high level of compliance of those taxes. And, unlike any other profession, they do so abiding global code of ethics. Their expertise and field experience contribute to the establishment of tax systems that enable environmental sustainability and social cohesion. In many ways, the accountancy profession stands out and is contributing to the public interest. Professional accountants are ready to take up the challenges and do their part in ensuring a sustainable future for our planet. BlogSustainable finance: what’s it got to do with accountants?